If it weren’t for a cast which boasts an entire constellation of indie stars, and the conspicuous ‘Best Director’ gong it’s been sporting since Cannes, Drive might be mistaken for a by-the-numbers action-thriller. Indeed, in an interview with The Film Programme director Nicolas Winding Refn stressed his love of the films he refers to as “the American Cinema of Violence”, leaving the impression that he has at least one foot in the exploitation camp. Certainly, if Drive’s artistic status stems from comparisons with 70s classics like Taxi Driver (1976) and The French Connection (1971), or from its quasi-mythic grandeur (it’s Shane  in a car! ), this shouldn’t obscure the fact that its visual and aural style is more evocative of 80s uber-schlock like Body Double (1984). The very breadth of Drive’s influences suggests its biggest potential drawback: in the middle of a tense, visceral thriller with Swiss-precision timing, it’s hard to stop reference-spotting, or to shake the feeling that there might be a bigger joke here which you’re not quite getting. Yet when Drive sets aside the posturing and gets down to basics, it’s one of the most stripped-down, effective thrillers of recent years. The opening sequence is a masterclass in action direction - a tense, kinetic chess game played out over the sound of a ticking watch, a police radio, a basketball game and the insistent bass heartbeat of Cliff Martinez’s electronic score (more on that in the Alternate Take). Then, after what seems suspiciously like a good-old-fashioned credit sequence (and when was the last time you saw one of those outside of a Bond film? ), Drive shifts down a gear, presenting a guileless first-act romance so quiet that you’re almost lulled into thinking that the twist of the knife is never going to come. The memory of that opening sequence refuses to fade, however, and as the unnamed driver (Ryan Gosling) grows ever-closer to his neighbour (Carey Mulligan), your eye keeps casting around for the things which might go wrong. In the way of the best thrillers, however, Drive is never as predictable as it first seems. Once the action really does start, Gosling’s driver is forced into taking ever more desperate measures to defend himself and the people he’s come to care about. From this point the film trips briskly between visceral set-pieces, alternating moments of brief and frenzied violence with ones of coldly calibrated brutality. In the best of these passages Drive uses violence expressively, approaching the poetically bleak tone of David Cronenberg’s A History of Violence (2005) or the Coen brothers’ No Country for Old Men (2007). 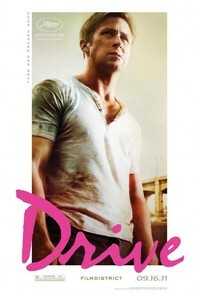 While Refn received the honours at Cannes, much of Drive’s success is down to the strength of its central performances. Gosling is inscrutable as the softly-spoken man-with-no-name. Whether he is entirely without feeling as he savages LA’s small-time criminals, or constantly and deeply hurt by his own capacity for violence, he remains silent. In a film like this we take his silence as a sign of good character, since the most loquacious and open characters invariably reveal themselves to be inveterate villains. Chief among these is a memorable turn from Albert Brooks as a one-time film-director turned third-rate loan-shark, though Ron Perlman is also good value as the more obviously vicious thug, Nino. The emotional heart of the film, however, is provided by Carey Mulligan as Irene. Giving Gosling a run for his money in the unspoken emotion stakes, Mulligan is wounded, eager for kindness, but never a victim. Her calm performance provides a mirror in which we can see Drive’s violence and danger reflected, and her empty face as she backs away from Gosling after a moment of particular brutality offers one of the most desolate moments in the film. This review was published on September 28, 2011.